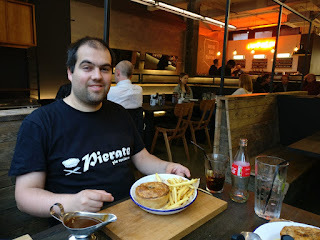 We Pierateers of pie review website www.pierate.co.uk are today celebrating our 9th Birthday, and we'd love you to join us by simply eating a pie and rating it! Our ninth birthday pie from Turner's Pies! It follows in the footsteps of the very first International Pierate Day in 2013, which has been celebrated on 12th November every year since! But we don’t want you – pie lovers worldwide – to just sit at home and watch as we eat all the pies! Oh no! Pie eating and pie rating is something we can all enjoy. Something that can bring friends, family and communities together. 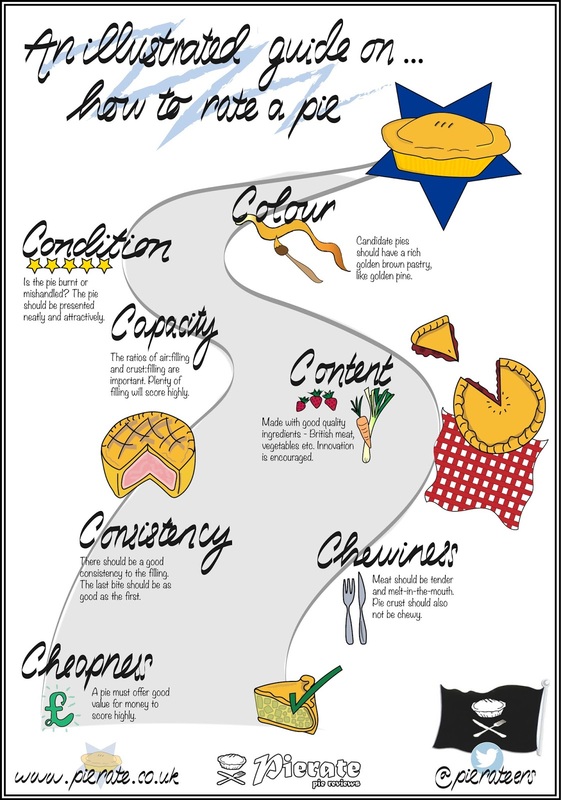 Pies are celebrated and eaten in so many countries worldwide and so today – marking our ninth birthday – we would love you to join us in eating and rating pies this week to celebrate! 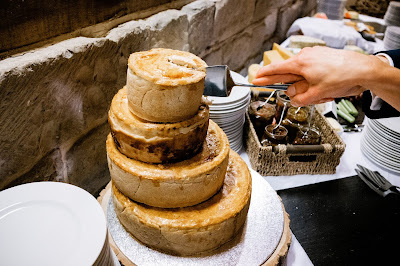 This year our main highlight was the birthday pie night we had, to celebrate with a number of friends of the blog, where we finally got to pie rate the British Pie Awards 2018 winners Turner's Pies! 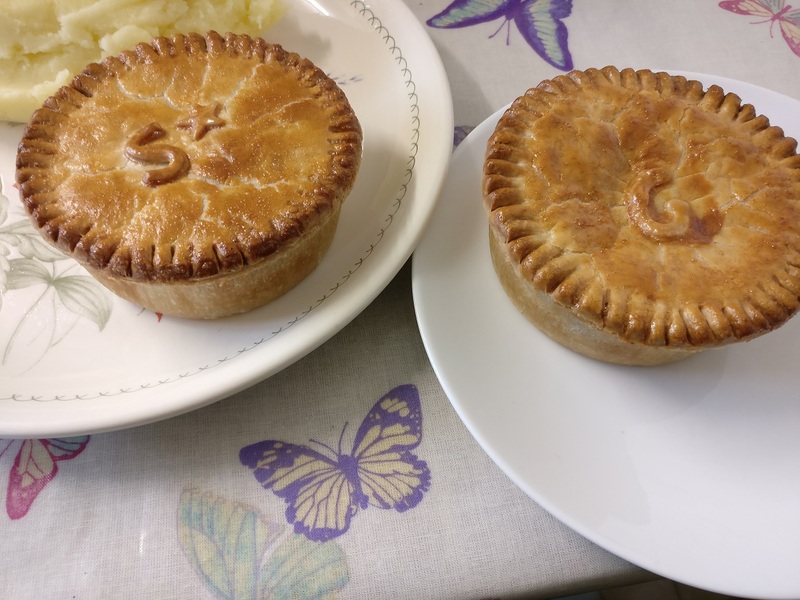 We rated their Steak and Ale pie recently, which was the pie that won the British Pie Awards this year, and will be writing up our reviews of some of their other pie flavours soon! Our pie eating friends enjoyed using the illustrated guide below on how to rate a pie, based on our 7 Cs of pie rating, which we commissioned fellow food blogger and amazing illustrator Emily from www.recipesandreviews.co.uk to create for us for our 6th birthday! 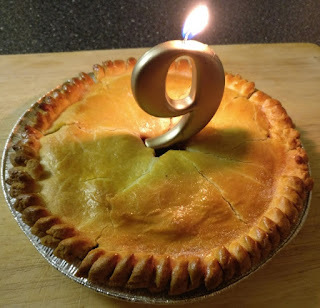 And in a slightly surreal moment, people spontaneously started singing hap-pie birthday to our pie blog when they saw the pie with the "9" candle in (pictured above!) Possibly the first time anyone has ever sung happy birthday to a pie blog before!! We very much enjoyed eating and rating the British Pie Awards 2018 winning pies from Turner's Pies this year at our annual birthday pie-rty! We've already rated the Steak and Ale Pie and will be posting our reviews of some of the other pie flavours we tried from the Turner's Pie range this week! Well, first things first - you need a pie (or two!) For insPIEration you might find our Pie Rankings helpful, with over 650 pies we've rated and reviewed over the past 9 years! Or perhaps you want to make one of the pies our Ship's Cook has made, following her reci-pies here. Most of all, we hope you enjoy eating and rating pies this week! We sure will and will be posting about more of the pies we ate for our birthday Pie Night this week!!! continue reading "International Pierate Day 2018"
Celebrating our 9th birthday with a Turner's Pie or two!! 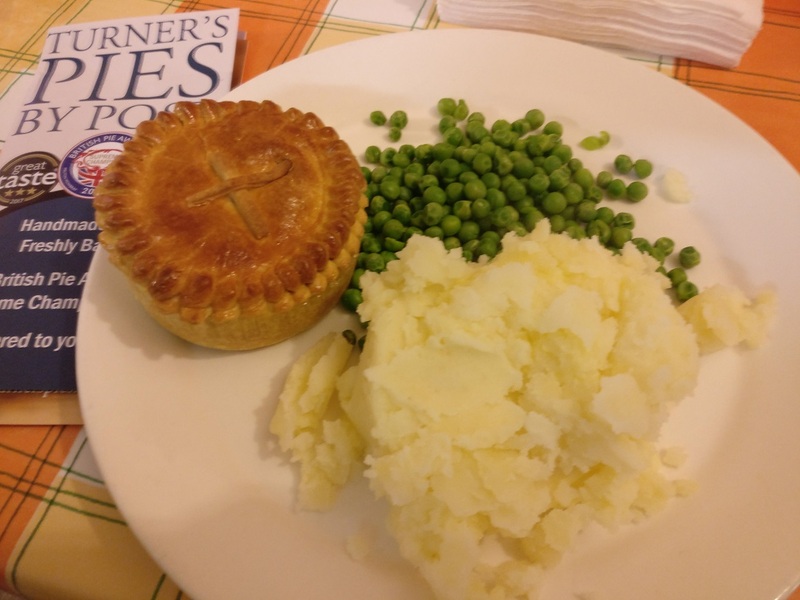 You may recall that back in March of this year the British Pie Awards Supreme Champion 2018 was none other than Turner's Pies, who had done very well previously and even been sold in Harrods food market, but had never previously scooped the big prize! Well as with all the pie winners since we started helping at the British Pie Awards in 2014, we wanted to get our hands on the Supreme Champion, and what better place to pie rate it that at the birthday pie-rty to celebrate our 9th anniversary?! The company are a traditional bakers based down on the South coast in West Sussex. Starting out making pies for a hotel in Bognor Regis in 1933, Turner's Pies have a long history down three generations as a family run business and it is great to see they have expanded in recent years to having a pie shop in Bognor Regis, Rustington, Chichester and now Worthing too! 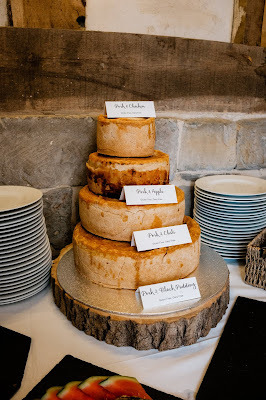 But having won the British Pie Awards back in March 2018, perhaps the most exciting addition is the availability to now order their pies online, with their "Pies by Post" service! 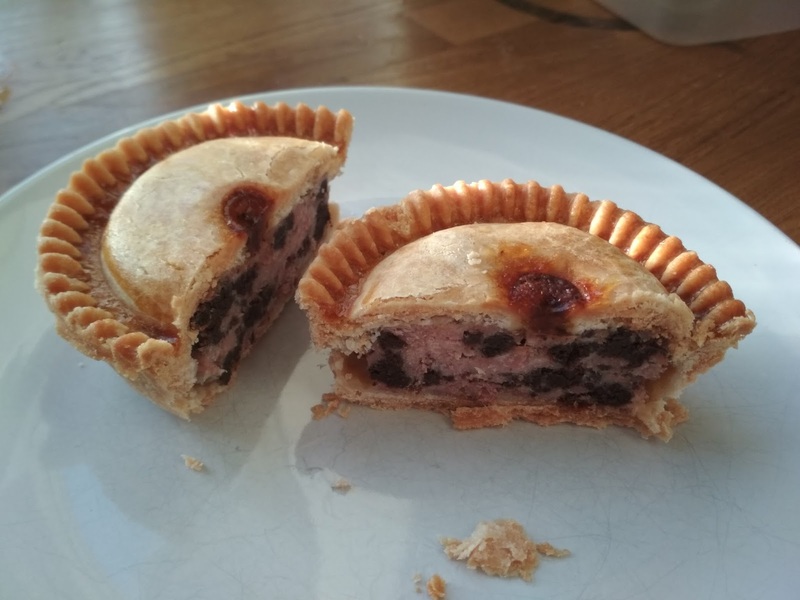 The "Pies by Post" service really is as simple and obvious as it sounds, with orders placed on their website getting delivered by courier a few days after ordering. Simple really! And there are a selection of pie boxes you can get delivered too, with free delivery on your first order, so what are you waiting for?! 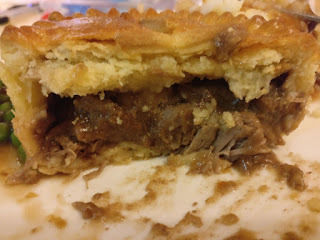 Ah yes - why not read our review below first of the Steak and Ale pie!!! If you missed it, here's the tweet they sent out when they won the British Pie Awards back in March! Our Steak & Ale Pie overcame stiff competition from 963 other pies to be crowned #1 In the UK. And after their win, Turner's Pies immediately set their eyes on another award - this time becoming the number 1 pie on Pierate! Thanks guys, we were waiting for the official press release before we told the world but it seems that’s not coming today. We’re chuffed! Only accolade we need now is no1 pierated!! So onto the pie review itself! The pastry was golden on top, slightly more pale on the sides, but it held together well even when cut in half. It was crisp on the outside and slightly gooey on the inside, a real art form in pastry circles! While the pastry did crumble a bit upon cutting, the fact you could enjoy the pastry so much even on its own was a great testament to this pie, even if there was no need to do so with such a meaty filling to the pie itself! And when cut into halves, you could still pick up this pie, which is a good sign of a firm, well baked pastry. The pie was well filled, with a good capacity of meaty chunks. Overall they were generally very nice, even if a few pieces in several of the pies were a little chewy. The filling was moist but could have had a little more gravy in it, but the ale gravy was a nice compliment to the meaty pieces. At £3.50 per pie this was about the price I would be happy to pay for this sized pie if it was well filled and flavoursome, as this pie was. 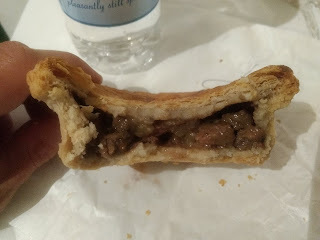 Overall, I can certainly see why the Turner's Pies Steak and Ale got a glowing report from the British Pie Awards, and it comfortably enters our "Pierate Highly Recommended" category! I look forward to rating some more of their pies soon! continue reading "British Pie Awards winning Turner's Pies Steak Review"
If you are a regular reader of Pierate, you may remember our review of the pies produced by Billy's Bakehouse. They particularly stick in the mind because these are classic Australian pies but they are produced in the Netherlands. They are also unusual because, despite being frozen and at a low market price point, these pies are genuinely tasty. The mastermind behind these pies is Darren Handley, a Aussie ex-pat who missed the pies he used to be able to get back home so decided to make them himself. During my honeymoon in the Netherlands this Summer I happened to visit Leiden, the home city of Billy's Bakehouse. Pierateer ALE and myself met up with Darren at one of the many canal side bars and got an update with how he is getting on. We discussed how Darren has built a new production bakery which they have moved into this year. This has increased their pie making capacity. They recently took 12,000 pies to the Lowlands Festival. Now that is a lot of pies! Darren enjoys doing the festivals and the fact the pies are frozen is perfect because they can meet whatever demand there is without wastage. With the extra capacity they are now looking to supply more supermarkets, restaurants and sporting events. With the pie being frozen it is very flexible for meeting demand. Darren says the UK market is still one that he would like to break into which, once established, would ideally see Billy's Bakehouse set up in some form in the UK. This is something we would love to see happen, despite there being a lot of pies on the market, Billy's Bakehouse could certainly fill a gap. 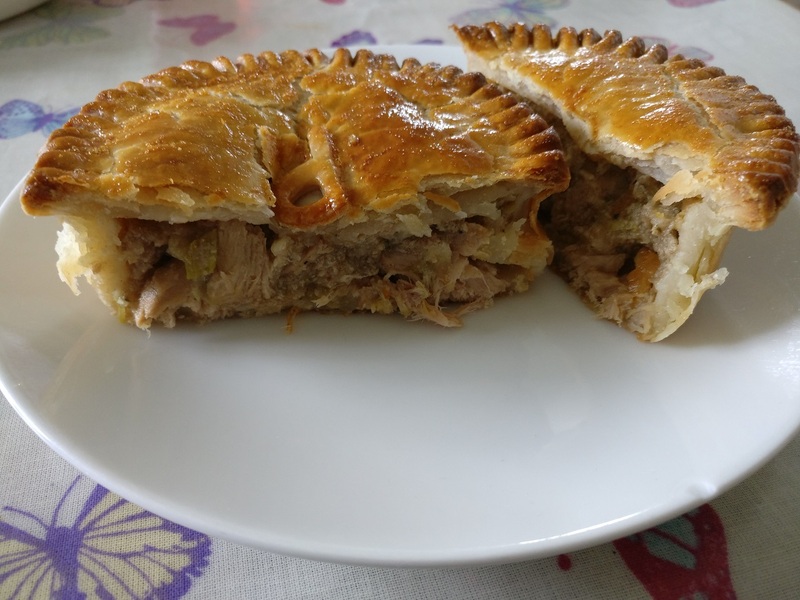 As we said in our review, because these pies cook quickly from frozen, they are perfect for organisations which will see strong peaks in demand, such as during half time at a football match. We are often disappointed by the pies on offer at football matches. This would be much improved if Billy's Bakehouse pies were adopted by some football clubs in the UK. We also discussed the article about Billy's Bakehouse which featured in the Discover Benelux in-flight magazine (see page 56). The article in entitled 'Taking on the big boys of pie production'. 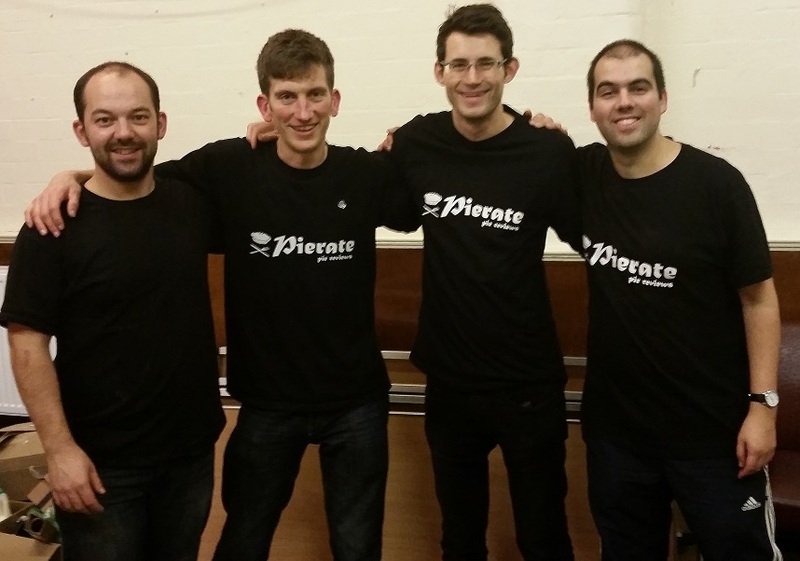 Darren kindly include a mention of Pierate saying that we 'wrote the review Billy's Bakehouse had been waiting for, leading the way to export to the UK'! We certainly do hope that our favourable review helps Darren in this mission. Fortunately, all the hard work hasn't put Darren off, he still enjoys his pies, with the Meat Pie in particular what he will eat away at festivals. There are a couple of new flavours in development including a Mexican-style flavour. We will be keeping an eye on progress and hope to try some more Billy's Bakehouse pies in the future. 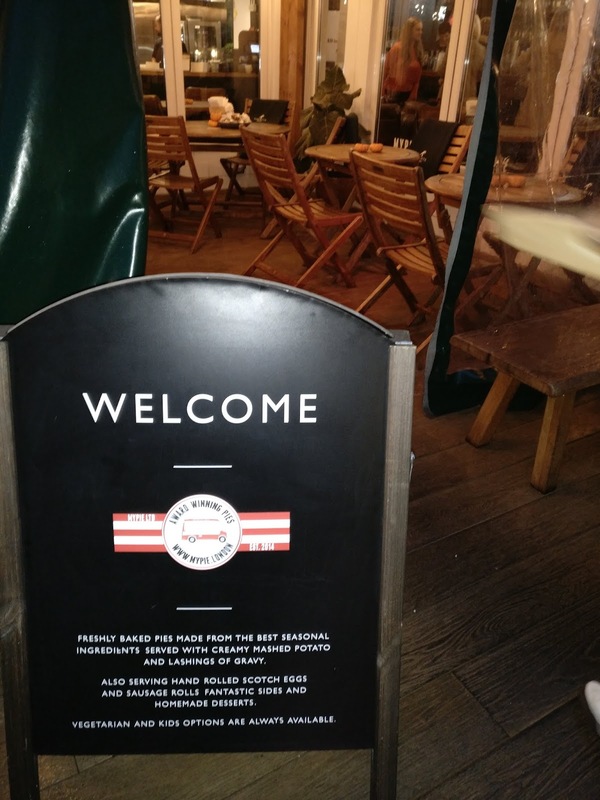 continue reading "Billy's Bakehouse Got Bigger"
MyPie in the sky - as London’s finest pies hit John Lewis! We first met Chris in March 2014, when Pierateer Tim met him for a chat and of course a pie down in South London. Chris had recently just won the Red Lion Barnes Great Sausage Roll Off a few months earlier, but we were glad his passion lied more in pies than just sausage rolls. And despite a little boil out, we could tell that Chris was on a winning trail when he let us pie rate his Beef and Red wine pie, which was Pierate Highly Recommended at 6/7 on the seven Cs of pie rating. Not bad for a first effort!! It didn’t take Chris long to get a pie near the top of our pie rankings, with his Chicken, Smoked Ham and Tarragon pie rating in at a whopping 6.39/7 in July 2015, swiftly followed by several other MyPie offerings making the top 10 of the rankings. But the most im-pie-ressive of them all was the Steak and Ale pie, which rated at a phenomenal 6.61/7. 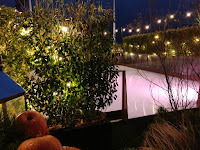 There's even a skating rink! While at the time this score ranked at number 3 on the pie rankings list, the sad demise of a fellow pie maker meant that in October 2016 the pie rankings were updated and the Steak and Ale pie became our number 1 rated pie on Pierate, a position it has held on to for over two years now! 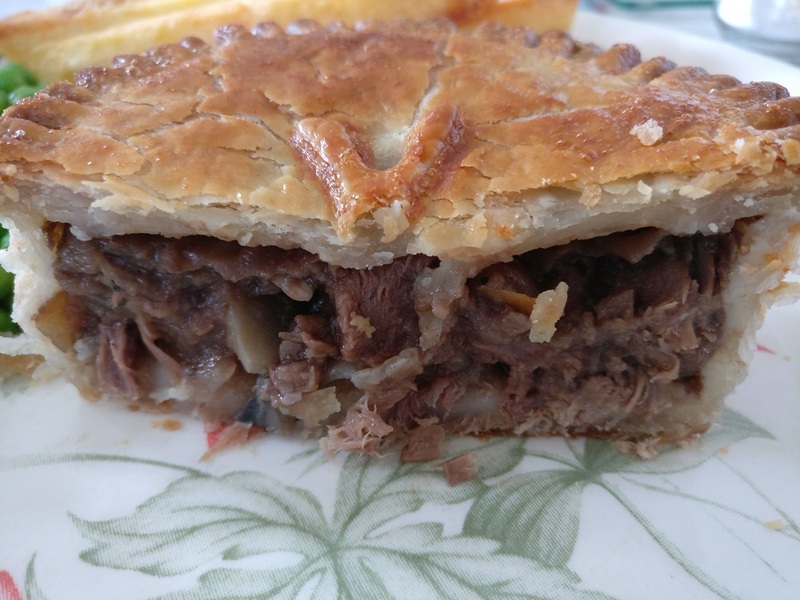 Since then, the Steak and Ale pie has been joined in the top ten by MyPie’s Venison, Chilli and Cheese (6.57/7 in 2nd place) and Mince, Bacon and Cheese (6.46/7 in 7th place). MyPie really do set the bar high for pie making in London and the rest of the country! 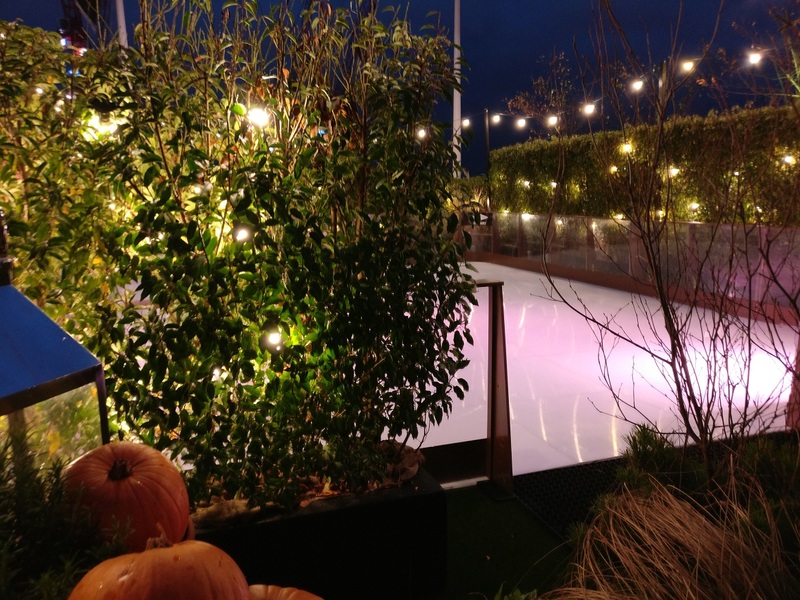 And we’re delighted to see the company providing the food at the skyline rooftop terrace for John Lewis’ winter wonderland! 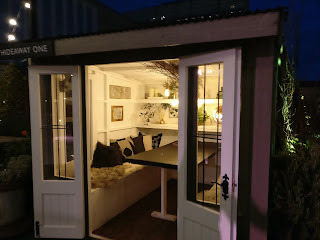 One of the lovely hideaways you can book up to eat your pie in! 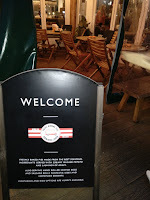 During our visit last night we were treated to a number of starters from the MyPie range, including scotch eggs and sausage rolls, but what we were there for was of course the pies! Being a launch event we were served some smaller pies than will be available when the restaurant opens on Saturday but believe me, these were still delicious and up to the usual MyPie standard! And being smaller, it meant we felt less guilty trying a couple each!! Click here to view all the MyPie pies we have reviewed. Pierateer Tim went for the Sweet Potato, Green Chilli and Feta pie (which interestingly was flavoured really well with the chilli but not spicy – something that again highlights Chris’ chef background!) and the Free Range Chicken, Ownton’s Butchers bacon and sweetcorn pie. Pierateer Rob went for the Hampshire Steak, Mushroom and Truffle Oil pie, followed by the Venison, Chestnut Mushrooms and Juniper pie (which is in collaboration with Sipsmith Gin London, who are running the bar on the roof terrace). 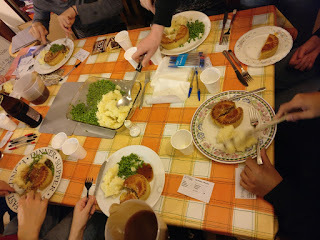 Unsurprisingly all the pies were well filled, flavoursome and left us wanting more! 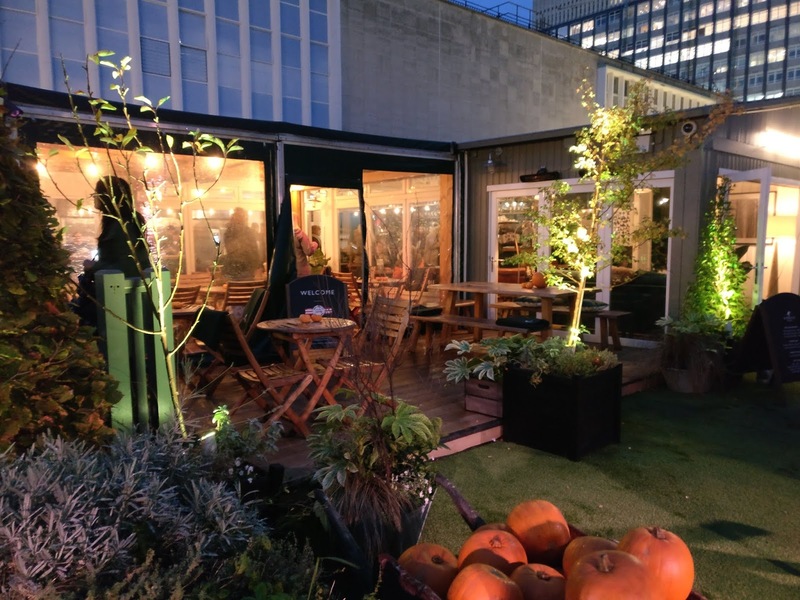 We can see this being a great success for the three month residency MyPie have on the rooftop terrace and hope that customers to John Lewis from near and far will very much enjoy the best pies in London as they have pie in the sky! 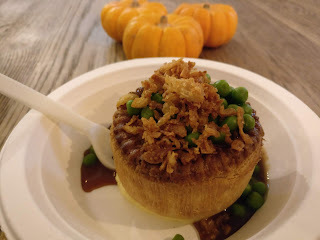 continue reading "MyPie in the sky - as London’s finest pies hit John Lewis!" continue reading "The Best Sunday meal you could ask for?!" 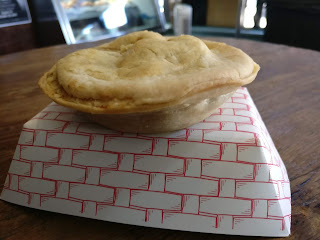 New York Pie Review: Meat pies need a Dub-ble take! For a city that never sleeps, there is one main draw back to life in the Big Apple. Sure, they have plenty of fruit pies on the market, but where are the meat pies??? As a Briton looking for an ex-pie-rience in what American pie can offer, I took a subway into Brooklyn to try out the pie shop at Windsor Terrace, next to Prospect Park, called Dub Pies. 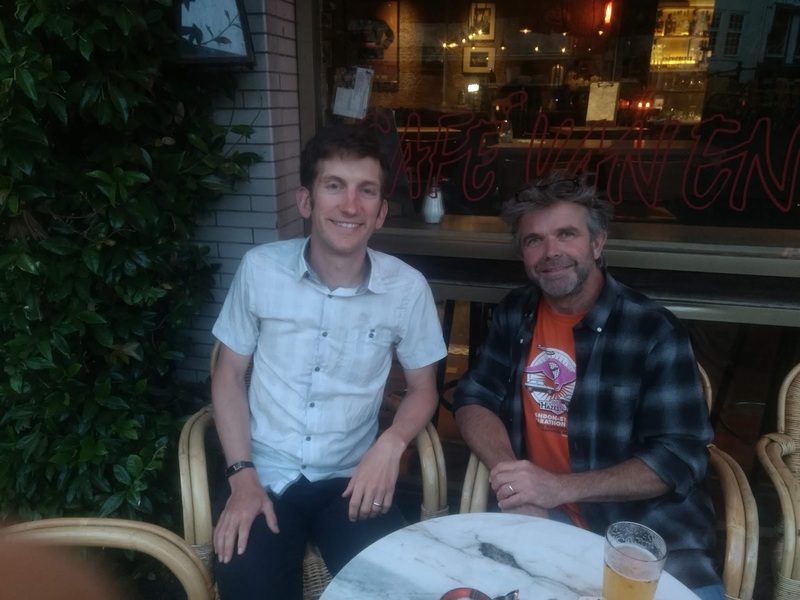 You may well have a vague memory of the name Dub Pies if you read our live blog of the British Pie Awards 2018, as we actually met the owner Gareth at the Awards! He had come over to the UK and timed his trip to include a visit to the awards and to sample some pies. His background is the meat pies of New Zealand, but you can never sample too many pies now, can you!! You could choose to have your pie hot or take it away cold, but I was in the market for a hot pie for lunch! 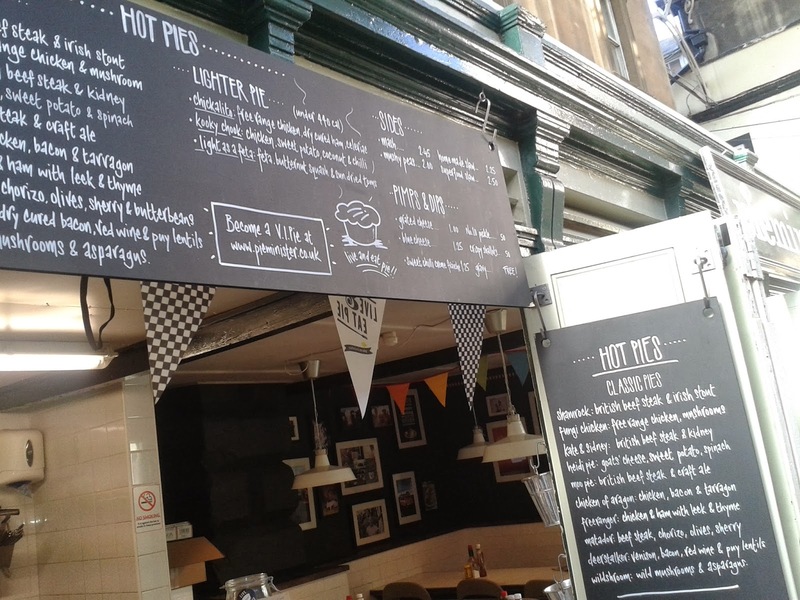 As you can see from the menu board in the photo they have quite an extensive range of pies, from the traditional beef mince and cheese pies common in New Zealand and Australia, to Chicken and Veggie options. However my eyes were set when I saw they had a steak and ale pie on the menu, which I felt would be a good benchmark to compare to the regular UK pies I regularly have. The content was pieces of steak in Fifth Hammer/Rockaways Blockaway Barleywine. At $6 this seemed very reasonable for a hot pie in such a location as central New York. The pie was reasonably flat, reminding me a bit of the Piebury Corner pies that aren't the deepest but are full to the brim of filling. These were the same. The pie wasn't the most golden I have ever seen, but the colour and condition was pretty good. The lid of the pie undulated slightly, teasing the large chunks of steak below. However when bitten into it held together very well. As you can see from the cross-section you could hold the half-eaten pie without it crumbling everywhere. It seems it would be the ideal pie for a sports event! The capacity was very strong, filled to the brim with meaty chunks. The meat itself was nicely cooked and tender, with the main criticism of this pie being that it was rather dry inside. I do come from a land of gravy filled pies - legend has it I would bleed gravy, not blood - but even so, the dry pastry and dry filling did take the edge off this pie. However the filling was very nice and I would certainly suggest that with a little more moisture inside this would really be challenging for a top pie rating! 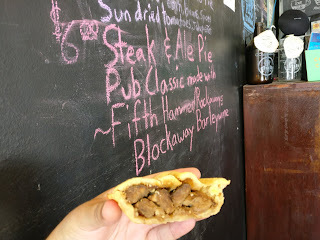 All in all I would certainly recommend giving Dub pies a look in and trying their traditional flavours - the Steak Mince and Cheese pie and the Thai Chicken Curry pie. It's as if they could read my thoughts or something! Just days after I had visited their Brooklyn shop, the owner Gareth messaged me on twitter to say that the low gravy content in their steak and ale pie had been noted before, and that they had now in fact created a new version which addressed the lack of moisture! You can check out the photo of their new steak and ale pie below and I for one would love to give this new version a pie rating! I wouldn't be surprised if it got Pierate Highly Recommended! Next time!!! The new Dubs Pies Steak and Ale Pie! This isn't the first time we've been over the Pond to New York! Check out our other New York pie reviews! 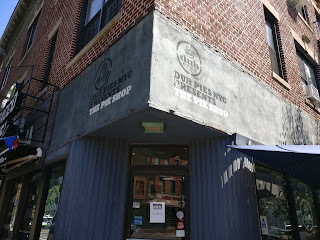 continue reading "New York Pie Review: Meat pies need a Dub-ble take!" Pieday Friday - 14th September 2018 - Pie votes, pie shops and pie delivery! After a busy summer period, including a couple of Pierateer weddings (check out the wedding pie we had!! 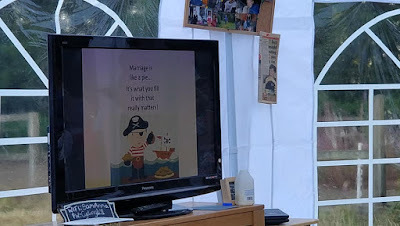 ), it's high time we set sail on some more pie related adventures! But before we do, we thought it would be rude not to fill you in on some exciting pie news we've come across these last few weeks. Check them out below! Fellow Pie rater needs your Pukka vote! 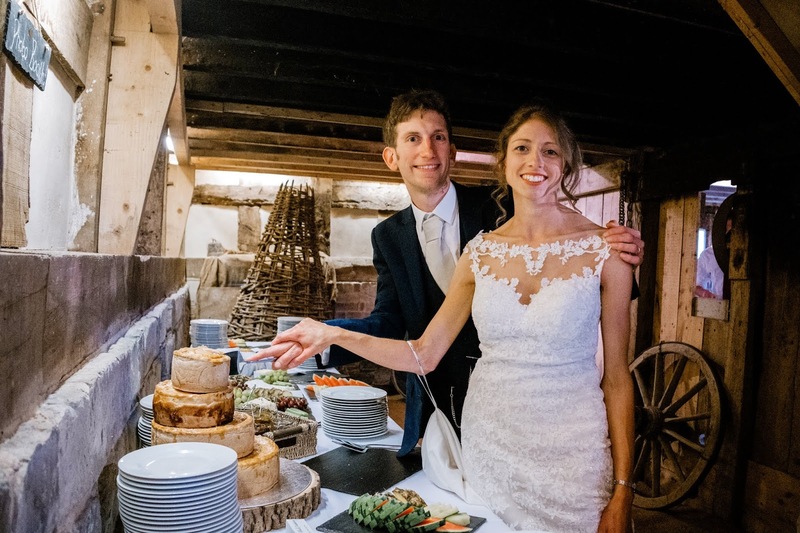 Regular viewers of our @pierateers twitter feed will know that we follow and regularly chat with fellow pie blogger and football fan Katie Peal, who came to one of our Birmingham Pie Nights and has been a fellow pie judge at the British Pie Awards with us. You can vote by either retweeting (for Katie) or liking (for Jim) the post above on the Pukka Pies Twitter account or voting on the Pukka Pies Facebook page until Monday 17th September. All the best Katie!! Pierateers heading back to Pieminister for their Sunday Best! You may recall back in March of this year during British Pie Week 2018 we hosted a Birmingham Pie Night at the Pieminister pie shop in Birmingham City Centre. 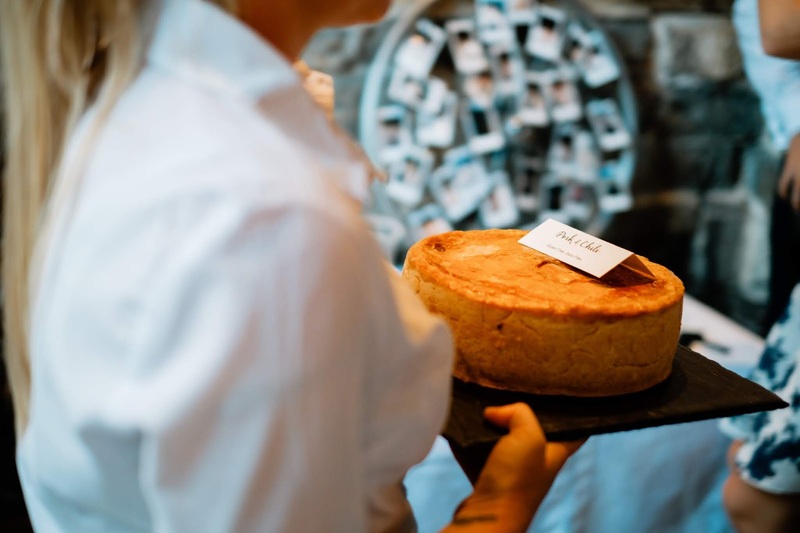 If not, you can read all about our Pie Night here - especially to whet your a-pie-tite as we'll be planning another for British Pie Week 2019! But before all that, we're excited to be going back to Waterloo Street this coming Sunday to try out Pieminister's new "Sunday Best" pie meal option. If you've ever thought "What would happen if you combined an award winning pie with a roast dinner?" 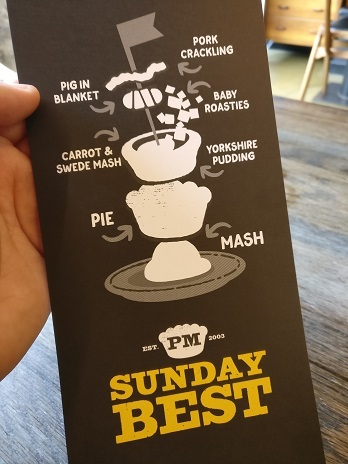 then think no more - you can try it out at your local Pieminister shop each Sunday starting this very Sunday 16th September! To whet our a-pie-tite Pieminister sent us a preview description and it sounds e-pie-c!!! 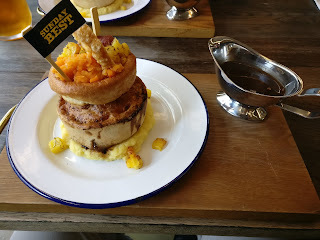 "The Sunday Best is any of Pieminister's award winning pies on a pile of delicious mash, topped with a Yorkshire Pudding filled with swede mash, roast garlic & rosemary potatoes and finished with free range British Pork crackling and a pig-in-blanket. All served-up with a brimming boat of gravy on the side." If that doesn't sound amazing, I don't know what does! Look out for the pie rating next week!! MyPie is set to open a London pie shop!! 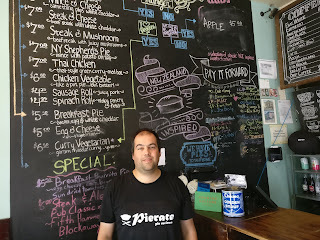 Pierateers with number 1 pie maker - Chris! 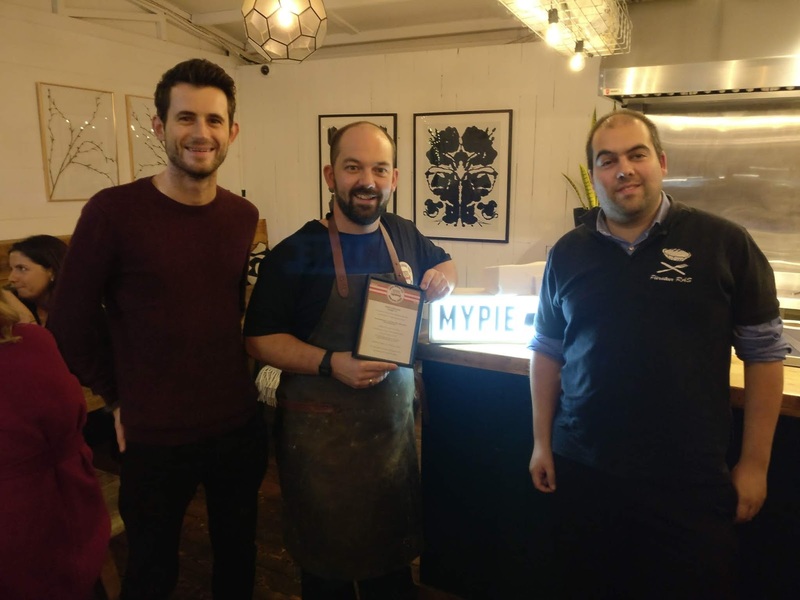 MyPie London, who make our number 1 rated pie out of over 600 have shared on Twitter that they're planning to open a pie shop in central London next month! 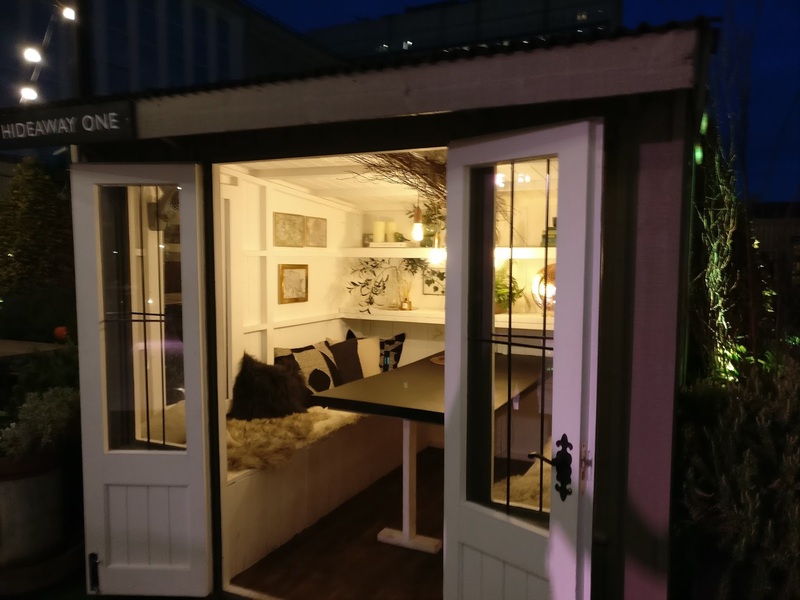 We'll be sure to check out the MyPie website for updates from Chris about the details, but the plan is to open 20th October in Zone 1 for a three month period. We for one cannot wait to visit!! 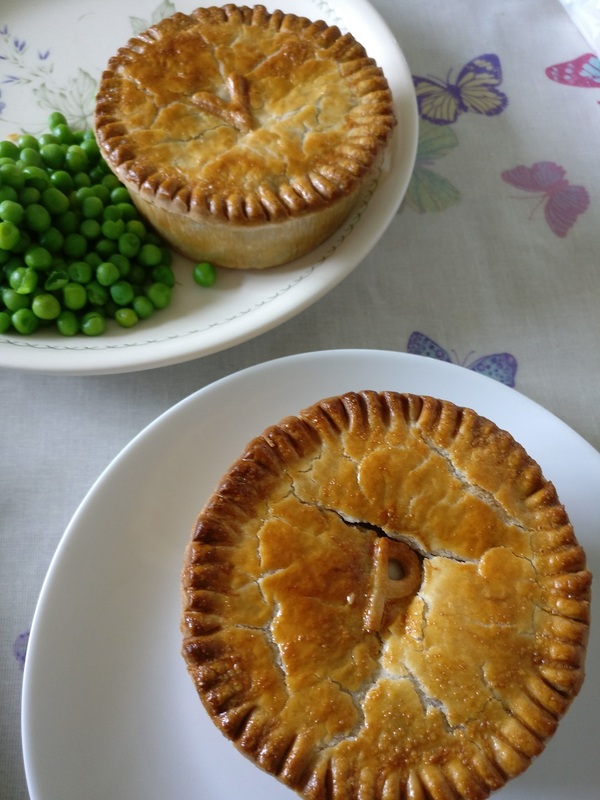 British Pie Awards Winner Turner's Pies are now available for postal delivery! Check out this great news from Turner's Pies, who were the Supreme Champions at the British Pie Awards 2018. They are now available for postal delivery!! We look forward to placing an order soon so we can get them on our pie rankings page. Act quick if you want to enter their com-pie-tition, which closes at 6pm today!! continue reading "Pieday Friday - 14th September 2018 - Pie votes, pie shops and pie delivery!" Often, because of the dominance of pasties, our beloved pie can be squeezed out. Hence I had a bit of trepidation about heading South to Plymouth Argyle for the match against Wycombe Wanderers. Would they even sell any pies to add to the Pierate Football Pie League? Entering the ground I started to worry, there were a lot of Ginster's adverts (they are even Argyle's main shirt sponsor). 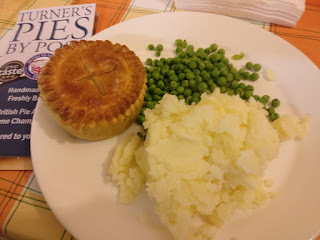 We have reviewed some Ginster's pies but they tend to be rare, with their fame mostly associated with the Cornish pasty. I needn't have worried, as well as a range of pasties they also had Ginster's Peppered Steak and Chicken Balti pies; a very wide range of pastry products. I opted for the Peppered Steak for £3.50, slightly more pricey than average for the size of pie (which was a bit smaller than a Pukka). It was presented well in an eco-friendly paper bag. 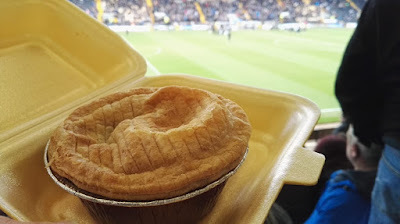 This not only prevents adding to the mountain of plastic in our environment but also seemed to have allowed the pie to breath whereas football pies in plastic/polystyrene can often be soggy. It had been sat on a warm counter which had kept it hot. The good Condition that this pie was served in was the biggest success for the Plymouth pie. It seems like they have a well organised catering team, making sure the food is cooked at just the right time rather than sitting around for ages and becoming dried out which is often the case for other football pies. Taking the pie out of the bag it looked pretty good, although it had sagged in the middle. It also looked a bit 'top heavy' with the pastry lid extending wider than the rest of the pie to make it look bigger than it actually was. 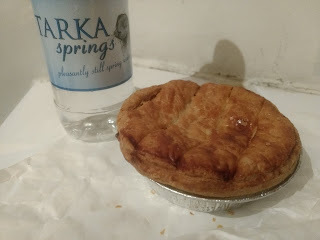 It looked quite different to the supermarket Ginster's steak pie that TJP previously reviewed and I was certainly hoping for a better score than the dismal 2.32 out of 7 which that version picked up! Delving into the pie it was immediately obvious to me that it was better than TJP's version. The pastry was perfectly cooked, quite rare for a football pie and quite difficult when you are cooking hundreds at once. Hats off to the Plymouth catering team for that. The lid had a nice crunch to it with a slight biscuit taste. The sides were softer, but not too soft, having also been properly cooked. There were identifiable pieces of steak, although they were perhaps a bit small compared to other 'steak' pies. There were also unexpected pieces of potato, which were fine and added some variety although I did initially think they were massive pieces of fat. There was a nice thick sauce, enough to keep it moist but not an excessive amount like you get in a Pukka pie. This was good because it meant the pie could be eaten by hand without making a mess, ideal for a football pie. The pastry also held together well. However, there was a lack of filling given the small capacity and the fact that the lid had sagged. My main note of caution was that when they say 'peppered steak' they mean PEPPERED Steak. There really was a big hit of pepper. I love pepper but I think it might be a bit much for some people. You could actually see the big pieces of pepper within the pie. The peppery taste in combination with the potato reminded me of that classic Cornish pasty taste! Perhaps no surprise when it is Ginster's making the pie. It was a really nice change and I did enjoy this pie, but it is not something I would be looking to eat regularly outside of the football. Given how well it was cooked, this pie claims a reasonable mid-table position in the Pierate Football Pie League. 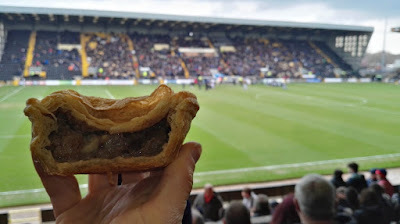 continue reading "Football Pie: Stick a Pie in your Plymouth"
Three of the Pierateers made their way to Meadow Lane for the clash between high flying Notts County and Wycombe Wanderers at the end of last season. Not having been before I was surprised at how the ground is almost right next to the home of their city rivals, Nottingham Forest. The fairly modern ground provided a reasonable fan experience. An entertaining 0-0 draw helped Wycombe on their way to promotion (and a whole new set of away day pies). Despite our campaigning for more choice, this is yet another ground serving Pukka pies. At £3 the price was about average for League Two. 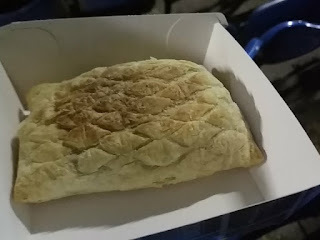 There was a healthy choice of 3 pies, I went for a Meat & Potato which is generally not available in Southern football grounds with it being commonly associated with the North. I guess Nottingham probably sits on the Meat & Potato and Steak & Ale divide between North & South. I normally prefer a Steak pie but it was actually a nice change to have a Meat & Potato, the thick creamy texture is something you don’t get in the Steak pie. This was a typical example of a Meat & Potato, it did a good job of capturing the classic peppery flavour. I am often a bit scathing about the potato element which we often regard as ‘filler’. But in this case I enjoyed it. When you have potato as a ‘filler’ you expect the pie will be well filled. In this regard I think they could have done a bit better, it wasn’t exactly exploding with filling, the lid had sagged down a little. I have had a lot of badly cooked pies at football matches recently but fortunately this one was cooked okay. Having said that the pastry base was dried and a little burnt although not too badly; it was still worth eating. The reasonable condition has helped give it a respectable score, especially for a Meat & Potato pie. 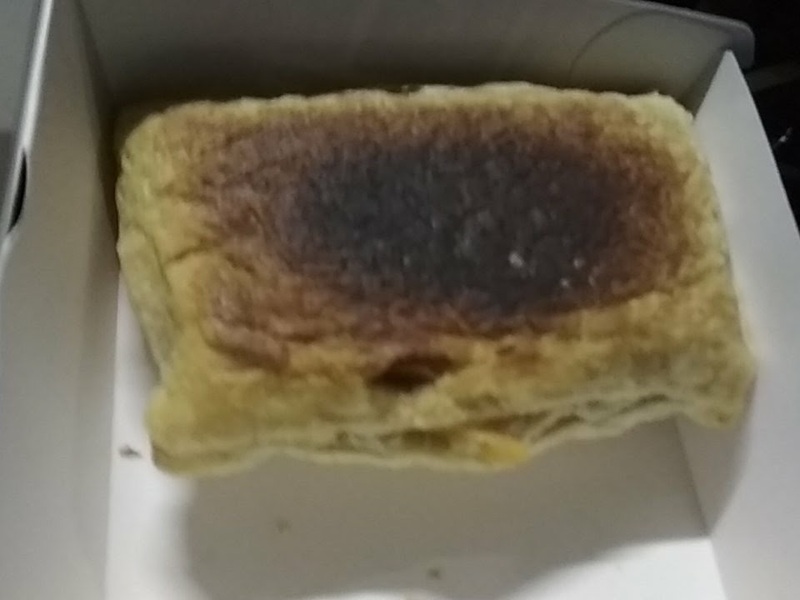 It did still fall apart on eating and I continue to question why so many football clubs choose to serve Pukka pies when they are not really suitable for eating by hand at a football match. The score sees a lower mid-table position in the Pieremiership, the Pierate Football Pie League. continue reading "Football Pie: Nott a Bad Effort"
continue reading "Wedding Bells on the Pierate Ship!" continue reading "Football Pie Review: Mad Hatters? Luton Disaster"
We came across the company Voakes during last year's #LeedsPieTour. Whilst not actually from Leeds itself, Voakes produced a proper Yorkshire pork pie and they narrowly beat the local boys Wilson's in producing the top pork pie of the #LeedsPieTour. Having already enjoyed the gluten version of the pie, we were excited by the prospect of getting our hands on the Voakes Gluten Free range for our coeliac reviewer, Pierateer ALE. They have a great choice of pies available for delivery from the Voakes Free From website with most of them also being dairy free (with some egg free vegan options). We were delighted to be sent a whole box of pies, including pies which were best eaten hot but with their reputation for pork pies we asled Pierateer ALE to review these first. All were eaten cold but of course, if you are from more Northern climes you might need to warm them up a tad. See below the reviews from Pierateer ALE, interestingly the free from pork pie scored almost exactly the same as the gluten version we reviewed last year. Condition - 5 out of 7 - I was really impressed with how good all of these pies looked. Given that Gluten Free pastry can be so crumbly these pies did well to survive travel in the post. This pork pie was a little bit broken but none of the others were. Despite being free from gluten and dairy, this pie looked pleasingly 'normal'. In fact it had a classic pie shape with a satisfying crimp around the edge and a vent hole. From the outside you might not realise it was a pork pie as it looked like regular pastry rather than the hot water crust pastry you often get with a pork pie. Colour - 6 out of 7 - For a gluten free pie I thought this looked really appealing. There was some glaze to the pastry although the colour was paler than many other pies. Cheapness - 6 out of 7 - This was the smallest 'individual' sized pie priced at £2.10 each. When you consider the premium that you often have to pay for free from products, this is excellent value. You can pay more than this for an up market regular pork pie! Capacity - 6 out of 7 - Most of the pie was filled with meat, there wasn't a lot of jelly but this suited me. There was hardly any air gap. Chewiness - 6 out of 7 - Compared to your average pork pie this had a great texture. Rather than being in one lump of ham, the filling had more granularity and bite. It tasted like pieces of gammon rather than ham. 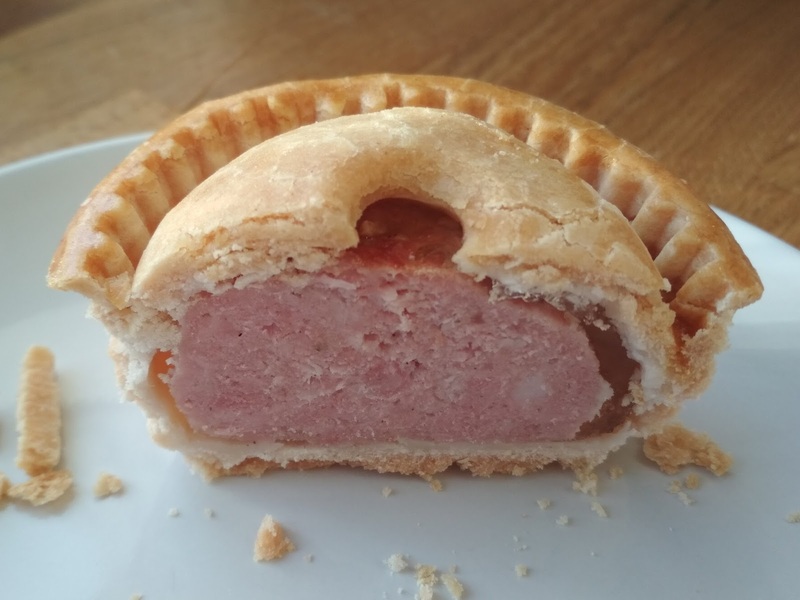 There were some small pieces which were perhaps a bit too chewy but you do expect a bit of fat with a pork pie. Sometime a pork pie can feel dense but this one didn't. I felt I could slightly tell that from the texture of the pastry that it was free from because it was a bit more crumbly but it was pretty amazing considering it had no gluten OR dairy. Content - 5 out of 7 - The flavours were subtle and what you would expect from a pork pie. But it was seasoned enough to keep it interesting and it was nice that it wasn't too salty like some pork pies with less good quality meat can be. Consistency - 5 out of 7 - Whilst it was an excellent pork pie, it was somewhat overshadowed by the other excellent versions which had more variety to the filling! 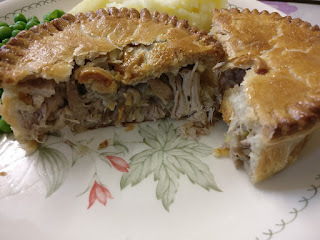 Condition - 5 out of 7 - This pie was similar in appearance to the pork pie and so scores equally highly. Cheapness - 6 out of 7 - This pie was the bigger 'large' size which retails at £5.80. It was enough for two people to share with lunch and again represented excellent value for a free from pie of this quality. 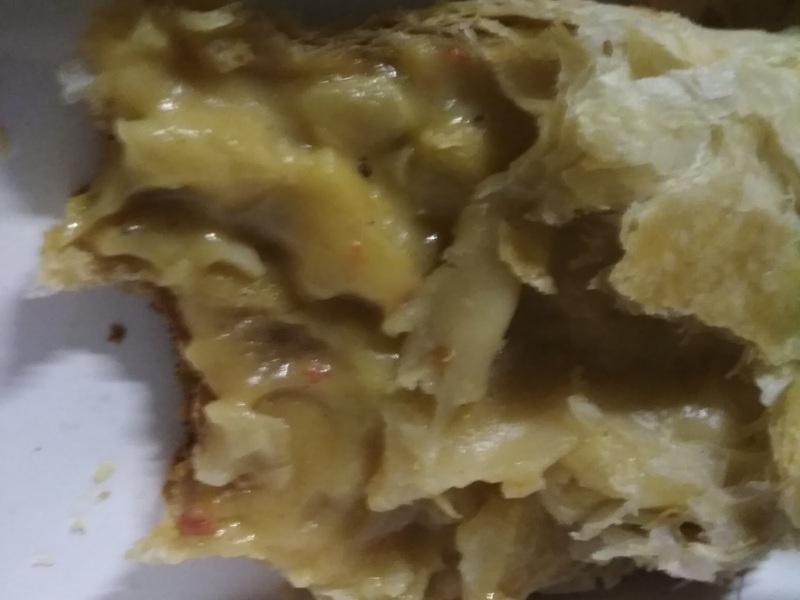 It is worth noting that this was a pie that Pierateer SJL could eat in one go so it depends on your appetite! Capacity - 6 out of 7 - Another pie crammed with filling. Chewiness - 6.5 out of 7 - This pie was anything but chewy, as you would expect, the black pudding was soft and made the whole thing wonderfully moist. It slipped down really well. 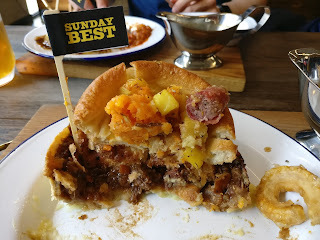 Content - 6.5 out of 7 - Wow, the tangy flavour from the black pudding really made this pie stand out. It is not the kind of thing you can normally get hold of as a free from product so this was a nice treat. The mixed up nature of the pieces of pork and black pudding kept the pie interesting from beginning to end. The flavours seem to have seeped into the pastry too, giving this pie an extra edge. Consistency - 6.5 out of 7 - I would say that the pastry and filling of this pie were friends, happy to be in each other's company which made for a brilliant final product. Condition - 4.7 out of 7 - Whilst it again looks good enough to get my tastebuds going, it loses out slightly on condition compared to the other two because of the jelly boiling out on top. Cheapness - 6 out of 7 - Another up-market large pie for £5.80. Capacity - 6 out of 7 - Again this pie was well filled, perhaps too well filled because the jelly boiled out! Chewiness - 6.5 out of 7 - The texture was like the pork pie but perhaps a bit more moist due to the chili. Content - 6.5 out of 7 - The chili added plenty of flavour and made the normal pork version look a bit boring. There was a sweetness to the chili and it wasn't very spicy but full of flavour. For me it wasn't quite as good as the black pudding version but I would choose this over the pork any day. Consistency - 6.4 out of 7 - The flavours of this pie worked really well. 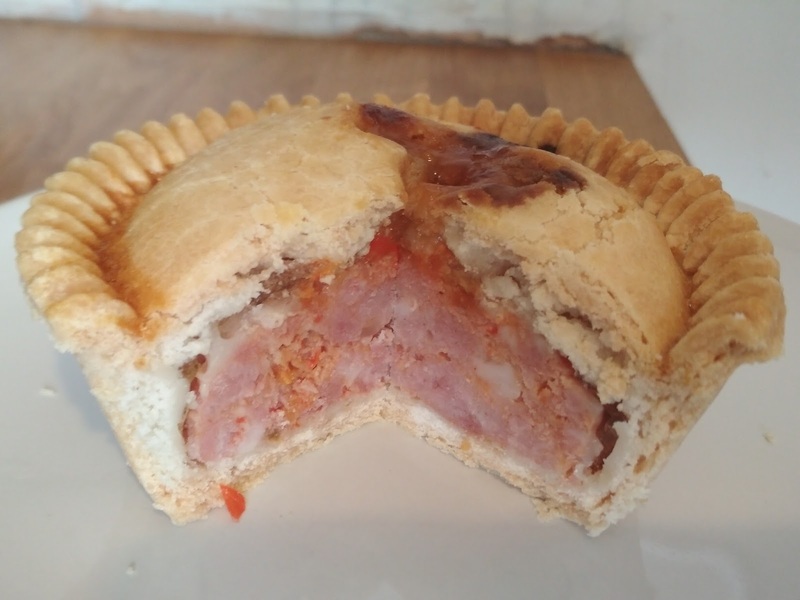 The chili flavour permeated through the whole pie so it didn't have to rely on an intense pork and salt flavour like many pork pies do. Overall these were excellent gluten free pies, in fact I would go as far as to say these were the best gluten free pies I have ever had! I would agree with their adverts that these pies are all of the flavour, none of the gluten. It is so nice that these pies are available and it doesn't feel like you have to compromise, they are better than the majority of the gluten equivalents. I would recommend them to anyone with allergies, you could even get the large ones to share and the great thing is people would never know they are free from! 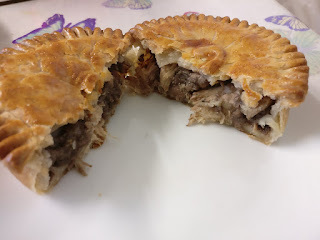 continue reading "Voakes Free From Pie Reviews"
continue reading "Burying our teeth into Stanbury Wild Game Pies"